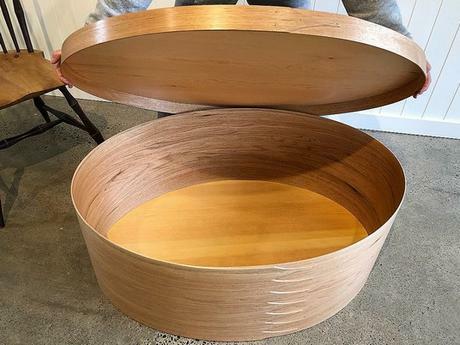 Melbourne Guild of Fine Woodworking | Classes: BIGGEST SHAKER BOX IN THE WORLD!! The Biggest Shaker Box in the World!! ‘Shaker Oval Boxes’ are internationally recognized artifacts of Shaker life and work. First made over two hundred years ago, these containers were made from simple local materials for community use and for sale to the general public until well into the 20th Century. They were mostly used to hold items such as buttons, tacks and food stuffs. They were the ‘Tupperware’ of their day! Simple, graceful and well made, they represented virtues that were very close to their ‘Shaker’ ideals. As some of you may know, in our normal introductory class you get to make 3 boxes (Sizes 1, 2 & 3). In this incredibly unique class, we will be making the BIGGEST SHAKER BOX IN THE WORLD, which is a #20! It measures 980mm long x 695mm wide x 370mm high, which makes it quite a substantial object! One of the unique features of this particular box will be that the sides of the box will be milled out of one single piece of timber. 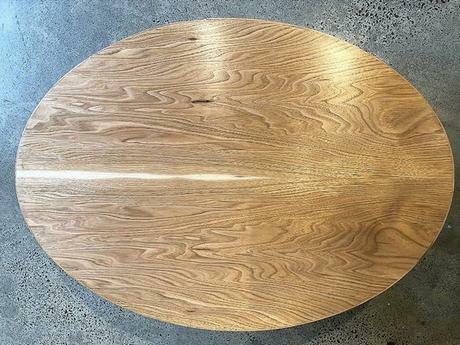 With a combined width for the lid & the base being around 400mm and a length of nearly 3 metres, this makes it quite a challenging piece of timber to source. However, with our contacts and milling capabilities, we are able to provide this precious material. This class will run over two consecutive half days for a combined total of 8 hours. On the first half day you will prepare your bands for bending, glue selected veneers to plywood for your top and bottom in our vacuum presses and lastly bend your bands around our specially made #20 forms and tack them together. For the second half day you will carefully cut and finish fit your top and bottom to your bands and peg them in place using special tapered pegs imported from Japan. 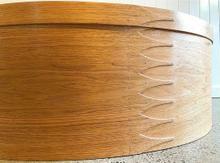 Time permitting we would also like to cover finishing options like Danish oil and Shelac. 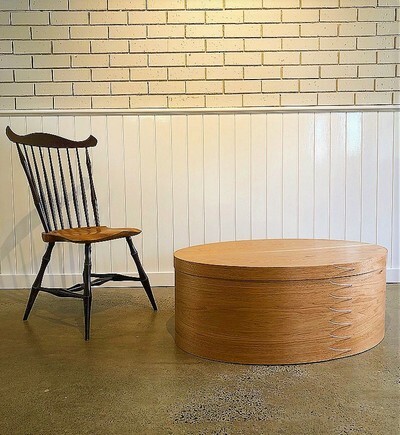 This object is truly a celebration of beautiful timber through a timeless and classical design that would no doubt be a centrepiece of any space. We feel there are two potential uses for this unique object: at the end of the bed as a blanket chest or as a coffee table with an elliptical glass top. As far as we are aware, The Melbourne Guild of Fine Woodworking is the only school to offer this course. Please join us for this exclusive opportunity in making ‘The Biggest Shaker Bentwood Box in the World’! Classes  BIGGEST SHAKER BOX IN THE WORLD! !